As I age and renew, I wonder about how little I know and I enjoy the potential that the greater unknown presents. Watch children and see how part of happiness in life is mixed in with discovering new things. Curiosity is a key in how to be happy in life. Taking anything for granted does not match the spirit of curiosity or discovery. I have learned not to take anything for granted especially points of views. Take childbirth as an example. We are so used to thinking about birth in terms of when pregnancy concludes. A brilliant and caring family member recently became a medical doctor. I have had the privilege of being treated by his grandfather who is also a loving person and a retired physician. Compare the grandfather the grandson is entering a new life. He is being born. His mother has gone through years of waiting, not months. The duration of “pregnancy” for this “childbirth” lasted much longer and was shared by the father, the grandparents and other family members and friends. In many cases, the joy of this type of birth reaches far more than the family. In this case, all the future patients of our new physician will be the beneficiary of this new birth. My parents have told me that I had an unusual and challenging birth that makes up for another story. Still I remember how my mother was traumatized for days when I started school and went to high school. It seemed to me that she was traumatized even more than my difficult childbirth than lasted a day or so. You see psychological, social, economical, chronological and more significantly spiritual birth do not coincide. Out of the five, the least significant is the chronological age. In my case, from wellness and fitness point of view, I have been extremely ill and fit simultaneously at a younger age, and less fit and in better health at an older age and anywhere in between. Socially I have never been born. Moving among various cultures I found the restriction placed on the members of any culture too confining to allow birth. Cultures by definition have a history, and the way we use history is not for learning but for establishing rigid structures that cannot withstand the scrutiny of honest questions. A single life is too short and too precious for us to live in confinement in any form especially the forms we create for ourselves. Regardless of how limiting and restricting I found social structures, I found it astounding at my own talents and skills. I could always create even more limiting and confining ways in my own thoughts, emotions, words, and actions than any outside structure ever could. I have a daily goal of rebirth. To be born into a new state of consciousness with more freedom. If this goal is significant to me, my thoughts, my emotions, my words and my actions should reflect at the very least my attempts to reach them. I have had hundreds of failures in all aspects of life and continued to have them. I fail as intensely as I strive, and I do not like a failure and do not intend to like it or get used to it. After each failure, I have to decide if the goal and that attempt had enough value to match the intensity of the mental and emotional failure. I have had many rebirths in many areas of life as well but only one significant spiritual birth several years ago. In hind sight, most of the re-births were not worth the attempt. However, the memory of that single spiritual rebirth is enough for me to strive for a lifetime if I had to. Fortunately, there are spiritual masters who guide me, remind me and assist me to make it easier. Compare to what is possible, regardless of what we have done in the past, we are still children waiting to be born. The question is what area of consciousness, life and experience do we wish to be born. We can even choose to be born into more confinement and limitations. Chronological age, even when we suffer from illness, is often not the main reason for our physical limitations. Many choose to be mentally and emotionally born into limitations associated with chronological age long before the chronological age enters the picture. 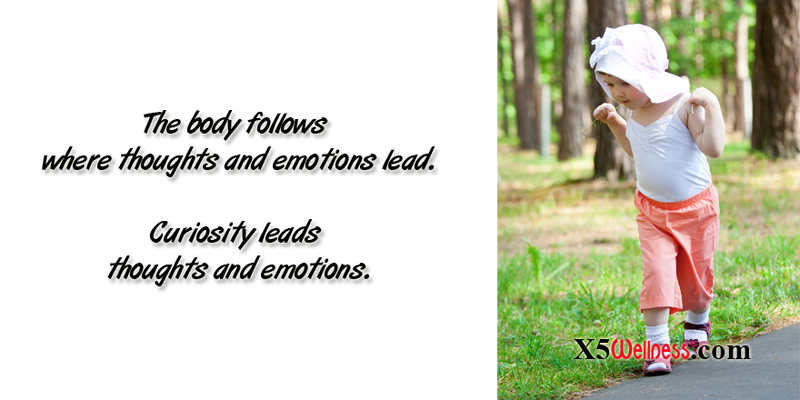 The body follows where thoughts and emotions lead. Curiosity leads thoughts and emotions. For me, what benefits the expansion of awareness in service to life provides the most personal and global benefit. Expansion of awareness and service pushes against my cherished thought patterns, forces my emotional attachments to unwind, restructures my words and rearranges my actions. Birth does not seem to be easy regardless of how many times we experience it. It is, however, the only way to a new life, new experiences and greater ability to experience joy, fulfillment and happiness. How can we be born into a new area of awareness and experience without birth? Aren’t you curious about how much happiness you could experience in life if you allowed room for self-discovery along with an interest about what else life has in store for you?